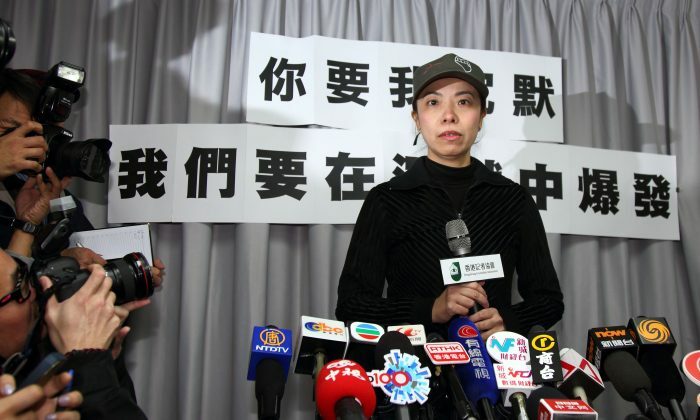 Hong Kong—Famous and outspoken Hong Kong radio host Li Wei-ling was fired without warning or explanation from her job at Commercial Radio Hong Kong on Feb. 11. A Commercial Radio spokesperson stated that the company would not comment on Li’s dismissal, but Li held a press conference on Feb. 13 giving her version of the event and her suspicions about the political motives behind it. Li said that Commercial Radio had given in to pressure because it was afraid the government wouldn’t renew its license. Hong Kong citizens have been increasingly worried about the suppression of press freedom in Hong Kong by the Chinese Communist Party (CCP). Events such as the replacement of the editor-in-chief of the Ming Pao newspaper and the advertisement withdrawals from the media am730 and Apple Daily are suspected to be interference by the CCP. After Li’s dismissal, 23 pan-democratic members of Hong Kong’s Legislative Council issued a joint statement urging Commercial Radio to explain the incident as soon as possible. At her press conference at the headquarters of Hong Kong Journalists Association (HKJA), Li Wei-Ling gave a detailed account of her dismissal. She explained that there are three widely circulated versions of the reason behind her dismissal—political pressure, offended executives, and a purely commercial decision—but she personally believes that the real reason was “one hundred percent” suppression of freedom of speech and press by the government of Hong Kong Chief Executive Leung Chun-ying. Li cried out to Leung that he can force her to leave, but he cannot force her to stop monitoring the government. “Leung’s years as Chief Executive are surely shorter than mine as a journalist,” she said. Li said agitatedly that Commercial Radio’s dismissing her in this way cannot be accepted, and that they owe her an explanation. “For sacking a radio host who monitors current political affairs, I think Commercial Radio owes the public an explanation too,” she said. Li added that the sacking incident is more than a single event. “The picture has become clearer that Leung Chun-ying is suppressing the media,” said Li, adding that she believes the CCP in mainland China has its role in this incident. She said that although there is no solid evidence, one can easily draw conclusions from the recent series of incidents against the media. She described how Hong Kong is under “sad wind and cold rain,” with its freedom of the press going severely downhill. There is no room for any sharper opinions to monitor the current government, she said. She said that without freedom of speech, everyone in Hong Kong is at stake. With her sacking and other incidents of media suppression, Li said she hopes the public will not think nothing has happened. In her speech, Li sarcastically thanked Stephen Chan Chi-wan, former chief executive and current chief advisor of Commercial Radio. Li said Chan told her that he suspects the government has been giving him a hard time on purpose. When Chan worked as a manager for Television Broadcast Limited, he was prosecuted for being involved in corruption. He eventually won the case after joining the Commercial Radio and was found not guilty, but the government immediately appealed. She suggested that Stephen Chan speak out publicly, but he did not agree. Li added that Chan told her over lunch last October that he took the initiative to knock on the door of the Communication Authority regarding the matter of license renewal, but they turned a deaf ear to his demand, so he would need to find another method. Later the situation changed, Li said. Chan began holding a notepad on daily basis and asking her to make changes to her program, but his comments were “nit-picky” things such as saying she read a person’s name incorrectly. He also questioned her for being too harsh on respondents. Li said in her speech that hosting the radio show every day put her under very big pressure, and it was like fighting on stage. She said that she has been working in Commercial Radio for nine and a half years, and in the first eight years she had complete freedom to explore the truth of each news item and speak out for vulnerable groups. After Chief Executive Leung took office, the situation has changed and she was not granted complete freedom. She strongly suspects that Leung was behind this. Li also disclosed that an acquaintance she has known for over a decade, who is in close contact with Leung, once warned her to be careful of her job. She said that this was well-meaning advice and not a threat. She said this was an honor, and it proves she has done her job well. She always knew Leung has repeatedly criticized her. On Feb. 13, the same day as Li’s press conference, the Hong Kong Journalists Association (HKJA) released a statement titled “We Will Never Bow to Suppression of Press Freedom.” The statement noted with deep concern Li’s claims that press freedom in Hong Kong is under serious threat. In the statement, the HKJA demanded in strong terms that Chief Executive Leung Chun-ying, as the highest authority in the city, scrupulously keep the promises he made during his election to ensure that the government and all public bodies will safeguard press freedom and freedom of speech as laid down in the Basic Law. The HKJA also urged the Communications Authority to examine whether Commercial Radio has complied with stipulations required for its license. On the day Li Wei-ling was fired, hundreds of her supporters gathered outside of Commercial Radio in the cold evening and held a candlelight vigil mourning the death of the freedom of press. Many of the supporters were well-known Hong Kong people, including senior journalist Ching Cheong, Joshua Wong Chi-fung, cofounder of the group Scholarism; Brue Lui Ping-kuen, former Senior China Correspondent of i-Cable News Limited; Reverend Chu Yiu-ming, a famous pro-democracy leader; and Yick Siu-ling, a Philippine hostage crisis victim. Ching said he came to support Li because the freedom of press in Hong Kong has been deteriorating, “one-country-two-systems” is becoming “one-country-one-system,” and the social ideology is turning into that of mainland China. Ching also wanted to ask the media tycoons if they realize whether their actions to cooperate with the CCP are benefiting China or Hong Kong. Ms. Sham Yee-lan, president of the HKJA, said that Hong Kong press has in fact entered a very dangerous situation after a series of changes of media personnel. She hopes more Hong Kong people will awaken, because the freedom of press is the cornerstone of democracy and the core value of Hong Kong all these years. Ms. Yick Siu-ling said with tears in her eyes that Li’s radio program has helped her after the Philippine hostage crisis, and she’s very grateful to her. Yick said she wouldn’t be interviewed by Commercial Radio anymore since Li no longer works there. Leung made a speech on Feb. 13 at a Chinese New Year reception at the Beijing central government liaison office, telling reporters that he and the government attach great importance to the freedom of press and speech in the past, present, and future. Leung’s office also issued a statement saying that Leung and the Hong Kong SAR government are committed to respecting and safeguarding freedom of the press, and that Leung himself never mentioned anything to anyone regarding Li’s post or duties. Gregory So Kam-leung, Hong Kong’s Secretary for Commerce and Economic Development, said that the Commerce and Economic Development Bureau has never pressured commercial radio executives or hosts. He said the government has great respect for freedom of expression and editorial independence, and therefore they would not comment on personnel changes or interfere with a broadcaster’s internal management. On the same day, Stephen Chan said in the program “On a Clear Day,” which he took over from Li in late 2013, that Li’s dismissal has nothing to do with license renewal. He said Commercial Radio has never knelt down for any political reason, and he was not given any pressure when he was the chief executive. However, during the Chief Executive election in 2012, candidate Henry Tang Ying-yen said in a television debate that Leung suggested suppressing Commercial Radio by shortening their license period. Leung refuted this as the distortion of truth. On Feb. 17, Li Wei-ling attended City Forum, a public forum held every Sunday by Radio Television Hong Kong (RTHK). After her comments about Leung in her press conference, many of Leung’s supporters went there to slander her. These supporters occupied most of the seats, and some of them tossed out insults at Li. The host, Joseph Tse Chi-fung, frequently gave them warnings. When she was accused of not having evidence of Leung’s suppression, Li said all the words that came out her mouth are the evidence, since she was a witness herself. She added that all the statements she made are from her own experience and what she has heard over the years. She said she has thought it over thoroughly, and her style as a radio host has never changed since she began in 2004. If she was fired for commercial reasons, then why could the broadcaster adopt her before, but not now? Besides, not long after someone close to Leung warned her to be careful with her job, she was fired. Therefore, she said, she has come to this reasonable conclusion based on the analytical thinking of an independent journalist. “The press not only needs to explore the truth and tell the truth, but they also need to have the courage to speak out with their judgment. Commercial Radio cannot provide a reasonable explanation for treating me differently. If this is not ‘kneeling down to suppression,’ then what is it?” Li said. At the City Forum, a tall man in black clothes and another man in a yellow jacket kept insulting Li loudly. These two men have also been spotted with the Hong Kong Youth Care Association (HKYCA), a CCP-supporting group with the mission to harass practitioners of the persecuted spiritual practice Falun Gong and disrupt Falun Gong events. Sources have reported that Li’s sacking was directly plotted by Zeng Qinghong of the CCP’s Jiang faction, who commanded Leung to force Chan to fire Li. The Jiang faction aims to disrupt the situation in Hong Kong and create a mess for the Xi Jinping faction. Leung, who was fostered by Zeng, has been performing the tasks assigned to him by the Jiang faction ever since taking office. Sources report that he has not hesitated to harm Hong Kong’s one-country-two-systems status and undermine Hong Kong’s internationally renowned business environment, forcing the evacuation of international capital. Withdrawing advertising funds from Hong Kong media and putting pressure on Standard Chartered Bank to withdraw Apple Daily’s ads are just some of the Jiang faction’s arrangements. Li Wei-ling joined Commercial Radio in 2004, and before that she worked for the Ming Pao and Apple Daily newspapers. She is known for outspoken justice for vulnerable groups and speaking out to expose wrongdoing. Starting in Feb. 2006, Li used her Commercial Radio talk show “The Tipping Point” to help Ching Cheong, a Hong Kong resident and media correspondent who was arrested in China on suspicion of espionage in 2005. Ching was sentenced to five years’ imprisonment but was allowed to return to Hong Kong on parole in 2008. Li created a daily program called “Yellow Ribbon in the Air” that announced how many days Ching had been detained and invited public endorsement of Ching. “Yellow Ribbon in the Air” persisted until the day Ching was released, making it the longest lasting program segment in radio history. The segment was awarded the Chinese Broadcast-Radio Prize in the 13th Annual Human Rights Press Awards 2008. Translated by J.K. Lu. Written in English by Sally Appert.